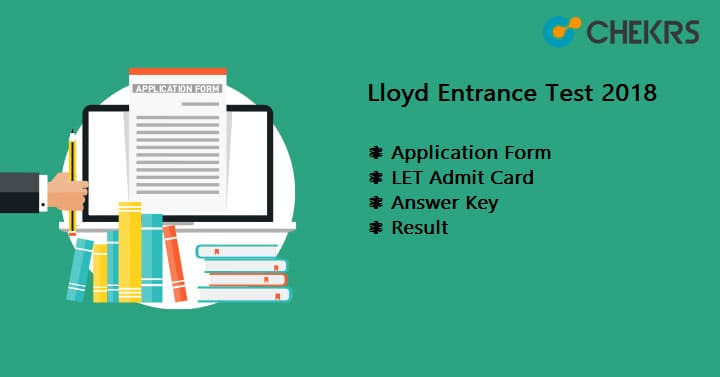 Lloyd Entrance Test 2019: Lloyd Law College (abbreviated as LLC) is a law school affiliated to Chaudhary Charan Singh University, Meerut. The institution is located in Greater Noida, Uttar Pradesh. It offers five years integrated course in B.A LL.B and 3 years LL.B course with specialization in different areas of law. Latest Update: LET entrance test will conduct on June 1st,2019. Hall ticket available from May 23rd 2019. Check complete details here. Every year, hundreds of students are admitted to the institute through a written common test known as LET (Lloyd Entrance Test). LET Entrance Test 2019 will be conducted this year in the month of May.LLC offers admission to the students who scored cut-off marks in LET or on the basis of CLAT score and also their performance in the personal interview round. LET 2019 exam dates are available online. Candidates can check the exam schedule of LET 2019 from the portal let.lloydlawcollege.edu.in. Here we are providing the LET Key Dates. These are confirmed dates taken from the official website of Lloyd Law College. Please go through it and be prepared for the exam because it is going to be conducted on 26 May 2019. LET 2019 exam will going to be conducted on 1st June 2019. The application form is available online as well as offline mode also. All the students are required to fill the form for the academic session 2019 in order to appear for LET 2019 before the last date of submission of the form. The application fee is Rs.1000/- for all category. Visit the portal of LLC. Click on “Create an account”, if you are a new user. After creating an account, it will proceed to the application form page. Fill the LET 2019 application form and click on save button. Pay the application fee through any modes provided there. For the candidate, who want to apply for offline application form click on the link “how to apply” provided at the top. Payment can be done by Cheque or Demand Draft in case of offline. For BA LLB, Candidate must have passed 10+2 /Equivalent exam in any stream with minimum 45% marks (For General) and 40%marks (For SC/ST) with English as a mandatory subject. For LLB, Candidate must graduate with minimum 45% marks (General), 42% marks (OBC), 40% marks (SC/ST). Students appearing in 10+2 examination can also apply. Personal interview round for LET qualifying student. Paper will consist of 150 objective type questions. Total time duration will be 120. Total marks will be 150. For each correct answer, +1 will be given. Paper will be held online except New Delhi and Greater Noida test center. LET 2019 Syllabus is prescribed by the authority of Lloyd Law College. LET exam syllabus for BA LLB and LLB programme is different. You can check the entire syllabus for both courses on the official site of the college. Take a look at the below mentioned precise syllabus for LET 2019. For BA LLB, the syllabus will be comprised of General Knowledge & Current Affairs, Mathematics, English including Comprehension, Logical Reasoning, and Legal Aptitude & Legal Awareness. The syllabus will be comprised of General Knowledge & Current Affairs, English including Comprehension, Analytical Abilities, and Legal Aptitude & Legal Awareness. LET 2019 Admit Card is available online for the students who applied for courses BA LLB or LLB successfully. Candidates can download their admit card from the official portal of Lloyd Law College. admit card will include student name, roll number, exam date, exam time and applied course. Click on the link provided there “Download Admit Card”. It will ask for Email-id. Enter the email-id you entered at the time of account creating. Enter the details and click on submit button. Admit Card will appear on your screen. Download it and take the print of it. Must carry your admit card during the examination with valid ID proof. LET 2019 result will be announced on 30 May 2019 after conducting LET exam successfully. Appeared students can check and download their result from the portal of Lloyd Law College. LET 2019 merit list will contain the name, roll number & marks of all students who have qualified the written test. Student qualifying the exam will be called for next process i.e. personal interview (PI) round. Applicants who will clear the PI round will be given admission at the college. Candidates name will not be listed in the merit list will not be eligible for admission in LLC for the academic session 2019-2019. All the students can improve their speed and accuracy by practicing the sample paper of Lloyd LET. It will help you to score good marks in LET 2019 exam. Question Paper with the solution is available on the college site. You can check and download it from there. Go through the previous year let exam paper know the difficulty level of question asked in exam and prepare accordingly.